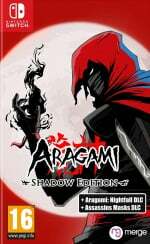 The action-adventure stealth game Aragami: Shadow Edition was originally set for release this fall and has since been delayed until early next year. While you wait for its arrival on Switch, below is a look at the Signature Edition powered by Merge Games. Much like the recently announced physical version for Riot: Civil Unrest, you'll get a bunch of goodies. This includes a region-free copy of the game, two limited edition pins, a soundtrack, collector's certificate, art book, a sturdy box with a foam insert, an outer sleeve with alternative artwork and a collector's card. There are only 2,000 copies available. According to the pre-order page, the game is expected to be shipped by the third week of February. If you do end up pre-ordering, you'll receive a free limited edition collector's coin. Are you anticipating the release of this game early next year? Will you be purchasing the Signature Edition? Tell us below. EDIT: Just saw the price and that's actually a decent deal. Might be a bit more tempted by it now. Is this the only way to get a physical copy? Will they offer physical for just the game? Waiting to be able to make the order but still can't. I’ll wait until the reviews come out for this before I put any money on this. I love stealth games! It's games like this that make me wish another good Tenchu game would be made. I'm assuming this will also get an eshop release as well? I remember watching a Let's Play of this years ago, looks pretty fun! Common when is coming soon over!!!! !